John P. (Jack) Vetter, photographer, teacher and author, passed away June 7, 2009. He spent most of his career In Pittsburgh, PA, much of that at Western Pennsylvania Hospital where he ran a well-respected photography department. 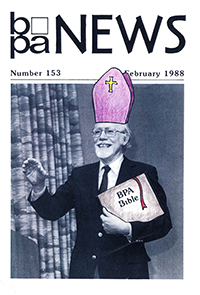 He was very active in the BPA/BCA. Over the course of his career, he published numerous papers and gave many oral presentations, most of these on technical photography. Over the years he received many awards and other honors both from the BPA/ BCA and other organizations. Known for his keen sense of humor, Jack was held in high regard by family, friends and colleagues alike. Figure 2. 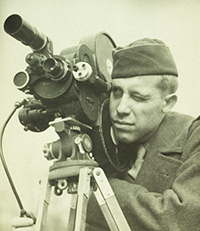 Vetter as a cinematographer in the U.S. Army. Figure 3. Vetter teaching photomicrography at one of the BPA’s Rochester Workshop. Figure 4. Jack Vetter preaching in lecture mode. Vetter’s middle intial was for Paul which many believed stood for “pontificating.” Artwork transforming this photo was by Donald G. Selchan, one of Vetter’s former students. Figure 5. Gross specimen photo of liver section. Figure 6. Phase contrast photomicrograph of unknown subject. Figure 7. Color photomicrograph of section of plant material. Figure 8. Jack with Charlie Hodge. Figure 9. 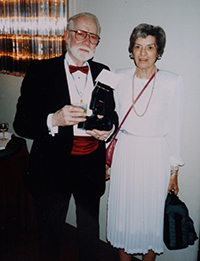 Jack and Mary Vetter at BPA Awards Banquet, Portland, OR, 1992. John P. (Jack) Vetter, a highly skilled and world-renowned bio-photographer, passed away on June 7, 2009. He was a master craftsman who greatly enjoyed his work, and was an authority, particularly on photomicrography, who devoted much of his career to teaching others one-on-one, in the lecture hall, and through his publications. Jack was born July 18, 1920, and except for service in World War II, spent his entire career in Western Pennsylvania. His Central Catholic high school diploma states that he graduated in the ‘Scientific Course,’ a rather specialized distinction in 1938. He was considered a bright young man with great prospects, and got his start with Parry Studios, a leading Pittsburgh portrait firm. He quickly excelled at taking and finishing portraits, retouching, toning, and all the professional photographic techniques of the day. Jack, a life-long story teller, had a favorite about WWII which occurred even before he was drafted. Out on a weekend jaunt, he photographed a train of army tanks traveling east for shipment overseas. The railroad detective who stopped him demanded his Rolleiflex camera. “Let me remove the film,” said young Jack. It was strangely allowed. He developed and printed his photos, and later his camera was returned. Inducted into the US Army in 1942, Jack trained with a motion picture unit at Paramount Studios in Astoria, NY. The motion picture industry had its start in the NYC region, and some of the studios continued there even after most of the industry relocated to the Hollywood, CA area. Many non-theatrical movies were made there, as the Army Signal Corp organized and trained their movie crews. Jack appreciated expert instruction, but was amused by the ‘Army Way‘ of doing things; one classmate was selected because his ‘related civilian occupation’ was usher in a movie theater. George Cukor, celebrated director, was an instructor, and they worked with Bell & Howell 35mm hand-held Eyemo cameras that ran 75 seconds on a 100 ft. roll of film. One assignment was to tell a story using just that 75 seconds time, shooting in final sequence without editing. Jack served in Finchaven, New Guinea, and in Manila, The Philippines. Returning to civilian life, Jack began serving two leading Pittsburgh hospitals: the Singer Memorial Research Laboratory at Allegheny General Hospital, and the Pathology Department of the Western Pennsylvania Hospital (WPH). He received specialized instruction from his brother-in-law, Joseph T. Lappan, photographer at Mercy Hospital. He actually ran two departments for many years, and also served other hospitals on an ‘as needed’ basis. This was an era when technology was in major transition. ‘Old-Timer’ physician clients still expected the view camera approach. Large glass 3-1/4 x 4 inch lantern slides were the norm. Many strongly opposed the introduction of 2x2 inch Kodachrome slide because there were few projectors capable of auditorium quality presentation. Flash bulbs had not yet been replaced by strobes. Medical motion pictures were often shot on 16mm. Kodachrome, in 100 ft. capacity cameras (2-3/4 minute running time.) The ‘original’ footage was often projected (possibly showing handling marks) before edited release prints were made. Operating rooms used explosive anesthetics. Virtually all professional photos were shot with a press/view camera. The industry was only just beginning to switch to medium format and the use of miniature cameras. Photomicrographs were mostly done on traditional large-format 5 x 7 inch equipment and contact printed. The integrated photomicroscope was yet to come. Kodachrome slides became the norm at WPH as the output rapidly grew in volume, and steadily improved in quality. Jack was strongly supported by Richard G. McManus, MD, Chief Pathologist at West Penn, and a training program began in 1953. A student medical photographer trained under Jack’s direction half the week, and then worked independently when Jack was at the other hospital. This was a great learning arrangement; the experience was invaluable (this writer was student # 3 during 1955-56). Jack came to work full time at WPH in 1956, and the student program continued for many years, with graduates disbursed around the world. Two weekly ‘photographic‘ conferences were initiated in the Pathology Department of the 1950s. Rather remarkable at that time. At Gross Conference on Wednesday mornings specimens from autopsy and surgery were examined by a staff pathologist in conjunction with the resident pathologists who had worked on each case. The student photographer shot color slides on Kodachrome Film using an Exakta SLR camera with a ‘macro’(close-focusing) lens, and a longer (75-105 mm) lens on bellows for close-ups. Each photo was recorded with specimen information and diagnosis. The student at the same time learned medical terminology and spelling. Kodachrome Conference was Monday morning, entirely organized and staged by the student photographer. He arranged the slides for discussion by a senior pathologist along with all the resident pathologists. The student did the projection, and heard all the discussion of each case. This was a valuable experience for the student, to see his work being used under the most demanding conditions. He wanted those slides to be the best possible. Vetter and Dr. McManus devised these two ‘photo-based’ conferences, and they proved to be most effective in the education of pathologists and medical photographers. 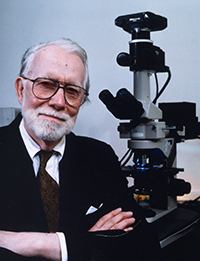 After Dr. McManus’ early passing, Dr. Ralph Erickson assumed the directorship of Pathology, and was a keen supporter of the many ways Jack’s photo/communication department expanded and gained recognition. Jack was active in the Biological Photographic Association (BPA) now the BioCommunications Association (BCA) during the late 1980s-1950s, and became a recognized leader in his region. He won many awards in the BPA Annual Salon, one in particular was for a large print showing Neurofibromatosis, the Elephant-Man’s Disease. Not only did it depict a spectacular (all-over body) condition, it was made using the 1940s Kodak Flexichrome process, in which a black-and-white silver image was bleached to yield a gelatin matrix image that then absorbed hand-applied (brush) color dyes proportional to the density of the original image. It‘s a lesson in photo-technological history, just to view it! At the noon break during one annual meeting program Jack marched over to the microphone unannounced and stunned everyone present with this direct forceful delivery: “There hasn’t been one good slide shown here all morning! I don’t know what’s the matter with you people, but if you cannot show decent work to your own professional association, what kind of work are you delivering back in your department?” He went on to chastise the roomful of BPA attendees and presenters, and insisted/demanded that they make better slides and produce only the best work for BPA audiences, and their own clients. He certainly did ignite the atmosphere in that lecture hall and the lunch break that followed. Jack Vetter was not always popular, but usually ‘right’ and highly effective. Those of us ‘close to him’ were very proud that day. He often came across as boisterous and a bit outspoken, his loud voice partly related to a lifelong hearing loss, which for some reason he never considered using hearing aids. Internationally known for his sense of humor, he could always be counted on for some really funny jokes, including some of the ribald variety, if he thought the occasion appropriate. His delight in horseplay and shenanigans often involved Charles, ‘Charlie,’ Hodge of Montreal, Canada. While at the Mayo Clinic meeting in Rochester, MN, (hotels work closely with the clinic) one of them called and ordered an enema for the other. Charlie once called a hotel desk late at night, identifying himself as Mr. Vetter, complaining there was no bible in his room. Jack missed the hospitality hour and was almost late for the dinner at one annual meeting, because Charlie and his friends had tied a rope from his door knob to the one across the hall. Jack truly loved his work and thought nothing of gathering his ‘disciples’ together on many a Thursday evening to work on some project with an educational slant. We all went along without question, even though it meant a late night return home across that big city on trolley cars of the day. The late nights usually ended at a dairy store and we were soon dubbed the ‘Milkshake Society,’ (Milkshakers). Half a century ago, spending an extra (volunteer) evening with Jack Vetter was a special opportunity, and still appreciated to this day. His children recall many evenings with students and associates assembled in their home. Two amusing gags are recalled from Thursday evening photo events. Jack smoked a cigar while we worked in the darkroom one evening, and he was amazed at having to relight it so many times. It just would not stay lit. One of the group had been placing one drop of water on the glowing cigar tip several times that night. The same jokester knocked on the darkroom bench, which Jack (with his faulty hearing) assumed was someone at the door. He was puzzled that they were repeatedly gone from the hallway when he was able to stop work and answer the door. He never did manage to get there in time. Jack was an instructor at the Annual Bio-Photo Workshops, organized by Percy Brooks and offered at annual BPA meetings. He specialized in Photomicrography, Motion Pictures, and Gross Specimens. No one else covered multiple topics. Jack later took over the workshop program, and moved it to Rochester, NY, where it was held on a regular basis in conjunction with RIT, and strongly supported by Eastman Kodak Co. These ‘Rochester Workshops’ were highly successful for many years. The workshop picnic was a memorable event held at a local state park. Enjoyed by all, it introduced nature photography as a regular element in the program. All the instruction was designed as preparation for the written examination for the Registered Biological Photographer program (RBP) which had been a major step forward in our profession. Jack was highly regarded by microscope manufacturers, with Nikon supplying many instruments free for the workshops and one for Jack’s own permanent use at home. He was consulted on many topics, and asked to speak all over the US and abroad. He was a member of the Institute of Medical and Biological Illustration (IMBI) in Great Britain, and taught in the UK often. Jack lectured at a fast pace, and after one IMBI talk, the moderator said: “Now I know what it’s like to try and stop Niagara Falls.” Vetter was recognized by the Royal Photographic Society of Great Britain, being awarded the Rodman medal for his career contributions to the advancement of photography. Jack was inducted as a Fellow of the BPA (FBPA) early in his career, and then attained the Registered Biological Photographer status, (RBP) under the established experience provision (grandfather clause) when that program was adopted. He received the Ralph Creer Service Award in 1977 and later the Louis Schmidt Award, BCA’s highest honor for his lifetime contributions to the bio-photographic field. Jack and his wife, Mary, provided foster homes for six children in their time of need. They subsequently adopted each of these children; what a remarkable way to assemble their large family. A wonderful group photo shows them each of different build, and looks, biologically unrelated, but as handsome as a garden of wildflowers! They traveled in a Chevrolet station wagon, often camping while on vacation. The Vetter family had a branch in the cast iron foundry business, and Jack would spot ‘Vetter’ inscriptions on man hole or sewer lids in other cities, and snap photos to show his family. In 1986 West Penn Hospital awarded Vetter their Gold-Headed Cane, the institution’s highest award, previously given only to staff physicians. It recognized his many educational contributions over a career that ultimately totaled 42 years when he retired in 1990. Mary Vetter had a similar gold-headed cane in her family, and realized that it would make a meaningful adjunct to the BPA’s Louis Schmidt Award. This cane became part of the BPA/BCA annual award ceremony held each year by the current laureate. Jack’s list of articles published in The Journal of the Biological Photographic Association and The Journal of Biological Photography is among the most extensive, and he also produced many excellent ‘handouts’ for workshop use to supplement his lectures. Much admired are the lab notes that originated in his department. He and his staff established standard operating procedures listing all the steps in their most frequently requested photo setups. Anyone on the staff could follow the recipe in their lab manual. The results were far more uniform and less costly than work from many photo departments where time-consuming trial and error techniques prevailed. Jack enjoyed conventional photography as well as the technical, and was a regular contributor to Pittsburgh’s Three Rivers Art Festival, producing photo essays about the artists and exhibiting his own artistic work. For many years he organized the photographic section of this major regional art event. How does one conclude what might be the ‘last word’ published on such an outstanding person? Jack Vetter clearly established himself as a professional, and made lasting contributions to the BCA, and the field of bio-photography. He influenced the lives of many: photo-colleagues, family members and readers of his works: often people he never met. Jack might smile at this summary of his career. He would be proud of a job well done, a life well lived, and having had a great time doing it. My thanks to Martin L. Scott, Joe Ogrodnick, and Ron Irvine for suggestions and editing.